Can any of you deny that Rava dosa is the tastiest of all dosas? Most would agree yes. I love them becoz it’s easy to prepare at home and they are crispy and tasty. Preparing this doesn’t involve much of the process, we need to prepare this mix just before 2 hrs or it can be done instantly too. Though it takes quite a long time to get it done on griddle than a ordinary dosa, it’s worth trying it for it’s taste. But note a point, they are crispy and taste very good when eaten as soon as they are out of griddle. So normally, when ever I prepare this, there will a plate ready with chutnies to be eaten instantaneously. 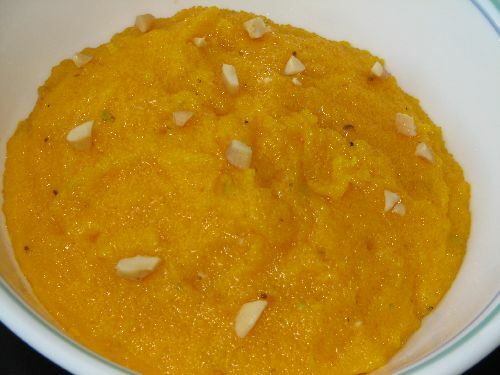 I really liked it when I ate it at Adayar Anandha bhavan, since then I never stopped trying it at home. Am sure everyone would love this recipe !! Mix all the dry ingredients well. Chop the curry leaves and split the red chili. Cut the cashews into small pieces. Chop the onion, ginger, green chili and coriander leaves to very fine pieces. Use the items given in “To Season Rava dosa Mix “. In a pan heat oil, when hot add mustard, cumin. When mustard splutters, add the red chili, pepper, curry leaves and cashews. Fry for 20-30 and add this to the dry ingredients mix and mix well. Mix the chopped onion, green chili, ginger and coriander leaves with the above mix. Add salt, curd and enough water ( around 3-4 cups). Mix them well and make a lump free watery mix. Heat the stove top griddle in medium flame, when hot, spill the mix all over, note the word, just spill them all over the griddle in any shape, make sure you don’t spread them out like you make ordinary Dosa. Spray some oil on top and allow it to cook for at least 5 min – 10 min or till they turn golden brown on the first side in medium flame and turn the other side. They would be very soft and break apart if turned before it’s done crisp on the first side. So care should be taken to cook properly till they turn golden brown on the first side before turning over. Add some potato masala in the middle of the dosa after it’s done to make it as Masala Rava dosai..
Add some finely chopped onions on the top side while cooking dosa to prepare it as Onion Rawa dosa. (*) Recipe from my Mother-in-law. 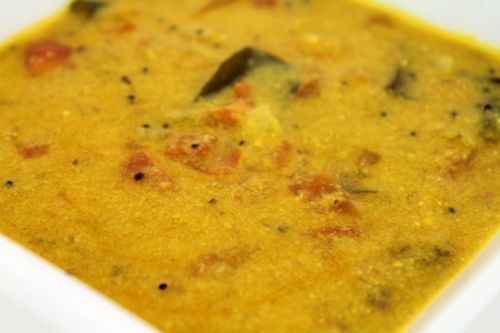 Serve with Coconut/ Tomato Chutnies or Hotel Sambar. 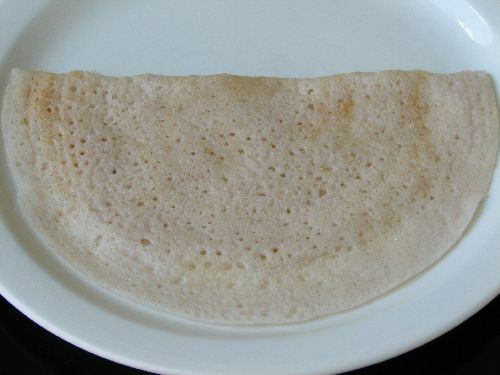 Can we use dosa/idli flour instead of rice flour to prepare rava dosa, sashi? The main reason to use the rice flour is it shouldn’t be fermented. Please try it out and see if you like it. nice and tempting….BTW , what camera u used? 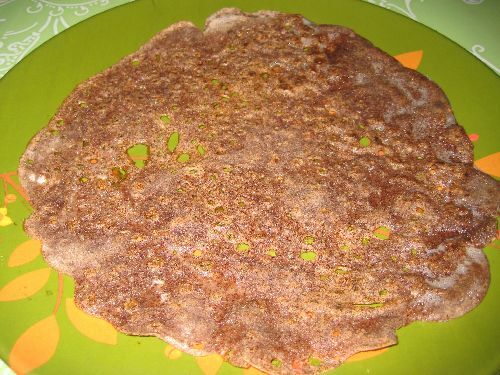 Wow what a crispy dosa…luv it! Rinks, Thanks for letting me know. I am very honored, glad you enjoyed. Love you’ll guys for the encouraging words !! Reminds me the rava dosa u used prepare in Bangalore…………. crispy colourful yummy rava dosa,my husbands all time favourite,i must try.my favourite too. Wow, excellent pics and love the way you presented it. Very inviting. Looks great…I have another version of semonlina dosa..will have to try soon and post it. Your post is inspirational! 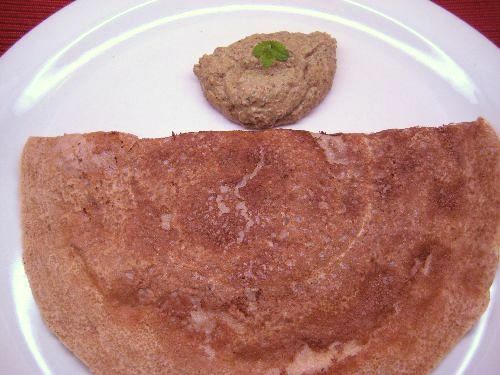 Awesome rava dosa … brilliant click ..
Why were u so excited to see me being from Karur .. am so curious ? Sashi, it is just paper thin and crispy. I can never (I declare), never make it so crispy or so thin. Amazing. I love the saravana bhavan rava dosa with triple chutneys..mmm..
Looks so crisp and tempting!! I cannot deny but I love all dosais!!!! 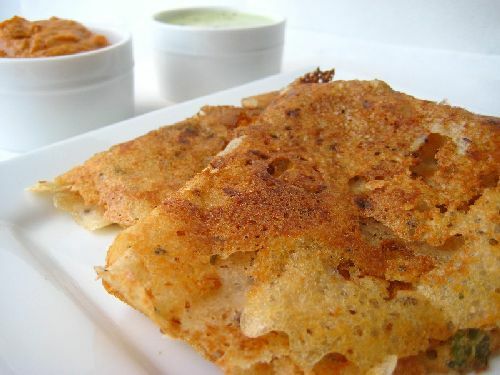 your rava dosai looks perfect, crispy and inviting with the chutneys beside!!! all I have to do is grab that plate and relish it heartily!!!! My tributes to your MIl for that delicious recipe!!! looks so crispy and beautiful…. wow!!! what a color! really want to try this…looks yummy!! YOur rava dosai’s look amazing. I like that you have great clicks of it.I was wondering what are you making it on. It looks like a new gadget. They look so perfect and yumm sashi..This is my fav too :-) Loved the addition of cashews.. Perfect and crsipy rava dosa!! Love it..
Rava dosas looks really thin and crispy.Delicious.My 1st visit here.You have nice space. 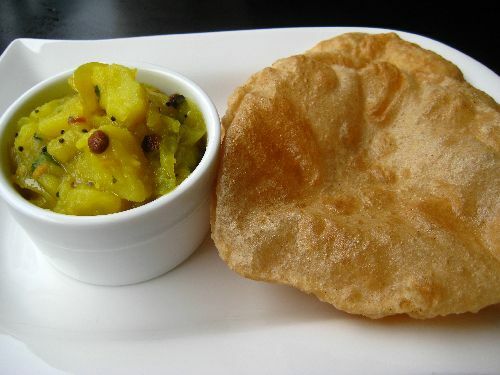 Just had my dinner and ur crispy rava dosa makes me hungry again..truly tempting.. I love how golden and crisp your rva dosai looks! yum!